The earthmen thought that there is no life on Mars. They were mistaken! This planet is inhabited and these creatures even have their own kingdom! 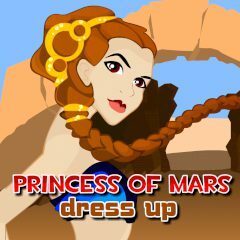 Help the princess of Mars to choose a nice outfit for her visit to the Earth in Dress up mode. Or take a dare and dress her up as you see it in the original picture in Compare mode!